When turning seven, my third son wanted a spy party. After we picked a date, compiled the guest list, and sent invitations, we turned our attention to party favors. 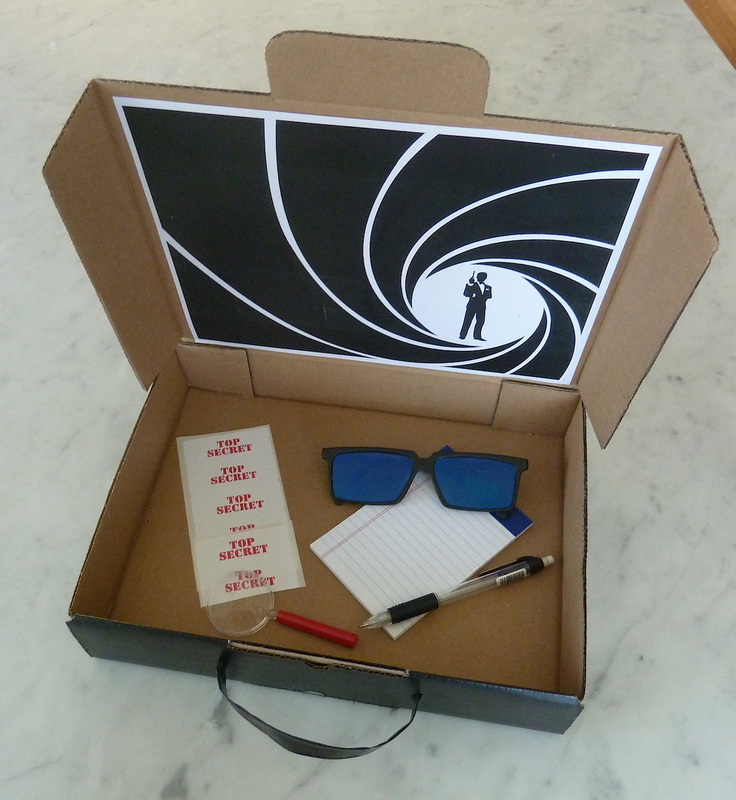 An older child suggested rear view spy glasses and, ever enthusiastic, my soon-to-be 7 year old continued, “…and a black suit and black loafers and a brief case so we can all look like James Bond!” We nixed the suits and loafers, but decided brief cases, we could make. So here’s what we did. 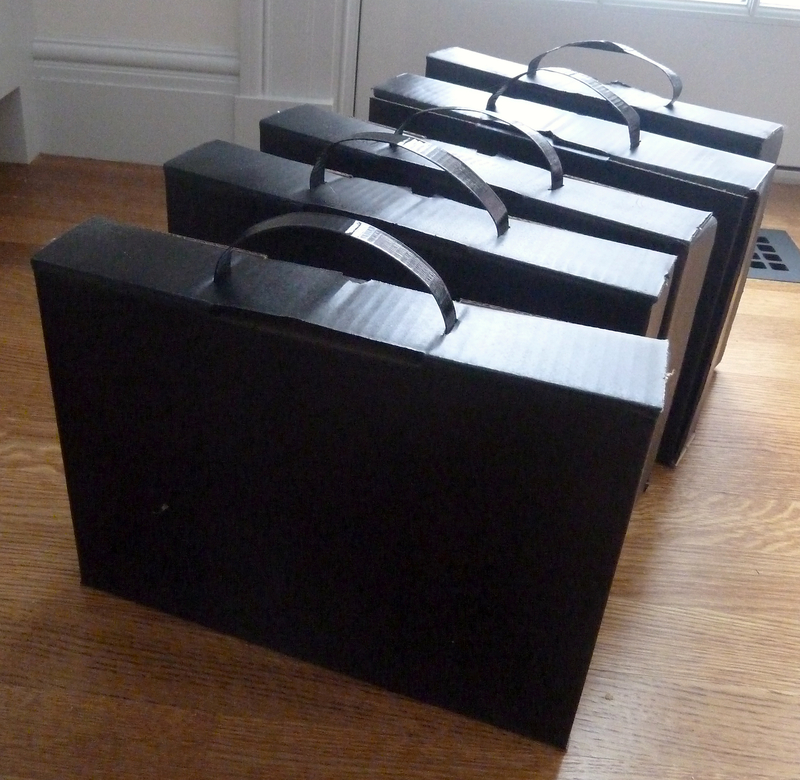 I bought these self-locking mailing boxes and spray painted them black. That was not my favorite task, so if I had it to do over, I might try to find black boxes. The next day, I glued them together with a hot glue gun. 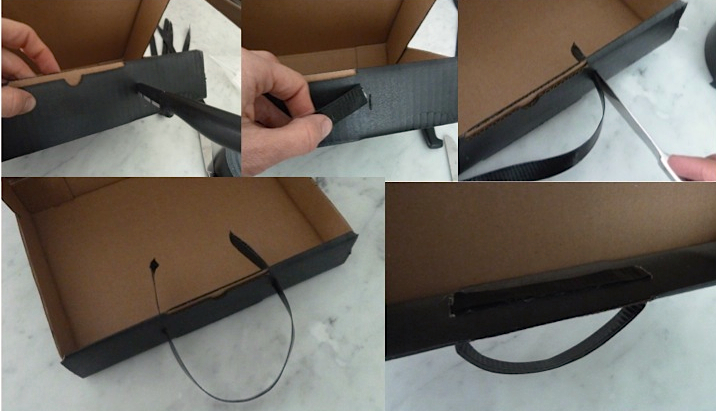 Then I made some handles with black duct tape, cutting strips and folding them in thirds. Using a sharp knife, I punched a slit for the handle, careful to make it wider than the tab that “locks” the top of the box down. I managed to thread a few handles through on their own but most required the help of a dull knife to push it through. Then I used the glue gun again to glue the handles down. Brief cases done. While these types of crafty projects are typically a collaborative effort in my house, this time, I ended up doing most of it. One son was sick and the others went outside to play the late March snow. Leaving me in our kitchen with the hot glue gun, wondering, why, exactly, am I doing this? Am I nutty? This is a kid’s birthday party – they could care less if they get an adorable party favor – all they want is some candy and a few trinkets. But then, again, I just can’t resist a good project. A few days later, at the birthday boy’s request, we spray-glued a James Bond graphic to the inside. 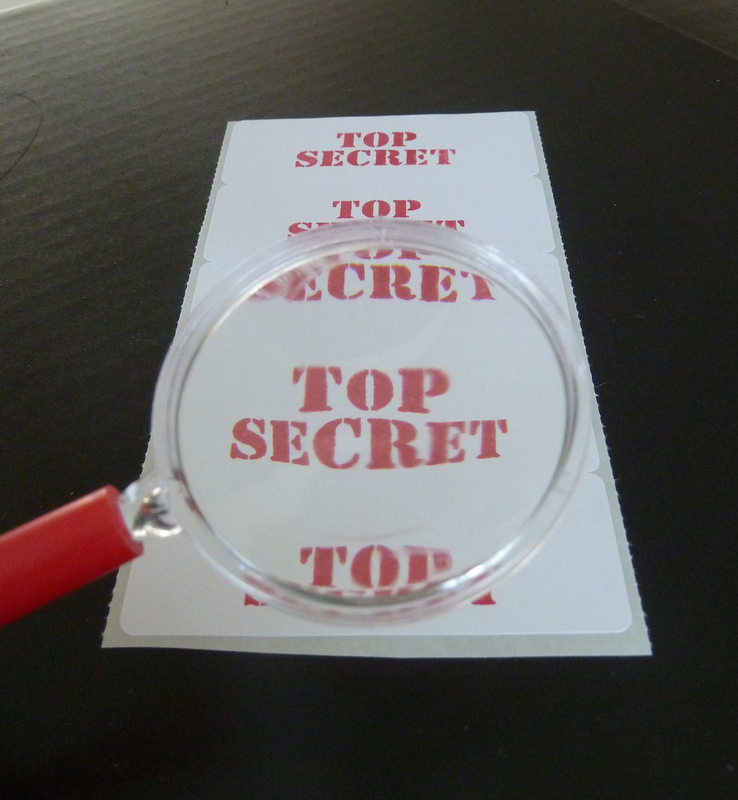 Then we filled them with the spy sunglasses, magnifying glasses, a small notepad and pencil, “top secret” stickers we made from mailing lables and a stamp. In the end my children declared that a goodie bag could not be complete without candy, so we threw in some twizzlers. Why twizzlers? I have no idea. Yesterday, we had the spy party and the brief cases were a hit, but I can’t tell you more, because its “top secret” though it might have something to do with those twizzlers. I love the project! I made the boxes from disused boxes that our new office telephones came in. Free! For the handles, I found black cable ties are the easiest. I added ‘top secret’ and ‘confidential’ labels on the outside along with each agent’s code name so they wouldn’t lose them. Debbie, I'm so glad to hear about your project. Re-used boxes are definitely better for so many reasons - environmentally responsible and free... awesome! Funny you put the top secret stickers on the outside because that is the first thing many of the kids at my son's party did when they got theirs. Thanks for letting me know about how yours turned out. seriously, you made my day! Where did you find the boxes? Just wondering if i can find them somewhere locally. Crystal, I bought them from Amazon (link is in the post), so I’m not sure of a brick and mortar place though my bet would be on Staples, Container Store or Mailboxes etc. They are listed as mailing boxes. Good luck and if you make them I owuld love to hear how they turn out. Thanks for reading!